IKA has been creating innovative laboratory equipment for scientists for over 100 years. That kind of brand power is any marketer’s dream, but how could that power be used to launch something new and completely different, that has the potential to change the industry itself? To kick off the start of their launch, IKA enlisted a form of influencer marketing. The company came to C&EN to run an advertising campaign for a set of teaser videos featuring two renowned chemists at the Scripps Research Institute, Phil Baran and Jin-Quan Yu. The videos said nothing about what IKA was about to launch, but that was the point – building an anticipatory buzz. IKA just needed the outlet to convey the message, to hit home that the company was about to change the field of organic chemistry. The advertising and marketing team at C&EN used our C&EN social media channels as well as display advertising on cen.acs.org and pubs.acs.org to drive awareness of the campaign’s kickoff. The next phase, however, was the product launch itself. It needed to go beyond banner ads and videos to truly convey the impact of the product, both at some kind of reveal of the new product, but also in a way that would sustain the interest of buyers post-launch. What was the right environment for IKA to announce its new product? How could C&EN create a buzz-worthy moment? How could we keep the momentum going? Our solution was to create a large in-person event at the ACS Fall National Meeting to grab the immediate attention of chemists. The ACS National Meeting & Exposition is one of chemistry’s largest conferences, drawing roughly 15,000 attendees. By tapping in to ACS, the publisher of C&EN, this venue allowed IKA to reach qualified and interested chemists through ACS’ database. The team focused on creating “moments” at the event that would be captured by an onsite reporter, such as an opening keynote introduction by C&EN’s editor-in-chief, remarks by the company owners, and a product demonstration in front of registered guests. Each element would generate content to keep people interested and extend the reach of the keynote and product launch, which was presented by their original influencer, Phil Baran. A successful promotional campaign led to over 1,000 registrants for the live event – a full-house onsite. These registrations were passed to IKA as high-caliber business prospects, with full CRM data, to provide leads to IKA’s team before the event even took place. Using the distribution power of C&EN and ACS, IKA didn’t limit the demonstration to in-person attendance however. They created a livestream broadcast at the product launch, garnering over 17,000 additional views from chemists who were not able to be present in person at the meeting. For a quick look at the success of our campaign, review our case study on the IKA program here. The next step kept the momentum of the product launch going. C&EN BrandLab’s executive editor had embedded a science reporter to follow the live event, and they gave the reporter backstage access to the company’s founder and owners, as well as Baran. IKA’s internal marketing team also provided additional access to early adopters of its new product. With all the different access points, we created a native advertising piece that gave color to the event itself, but went more in-depth into the product’s creation and application. The story helped extend the buzz over the new product well after its launch, running in the C&EN print magazine 6 weeks after the event, with a companion digital component. 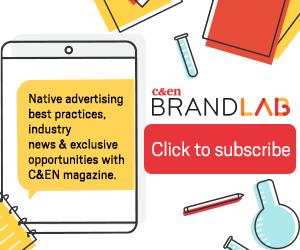 Putting together all the pieces, the C&EN team came up with a program that consisted of event marketing, influencer marketing, lead generation, and finally, native advertising in our own C&EN. Interested in learning more about how C&EN BrandLab could serve as a partner to amplify your brand or product? Contact us today to start the conversation.